End-to-End IT for Your Business. Everything you need to make your business go — phone system and service, email, tech support, firewall protection, servers, and much, much more. • Limited or no IT resources? In today’s competitive, tech-dependent environment, businesses are more reliant than ever on their IT infrastructure. And when their IT infrastructure fails them, businesses suffer, whether it’s a complete operational shutdown because of a server crash or phone outage, or something a little more minor, such as time wasted sorting through out-of-control spam. 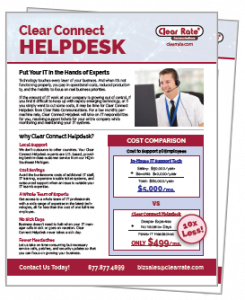 How much better could your business be if you had more reliable IT? Introducing Total IT. With Total IT, not only will your IT systems be dramatically more reliable than if handled in-house or by a so-so vendor, they’ll also be more affordable and free up your time to focus on more strategic business initiatives. With vast and varied technical expertise and a host of the latest cloud technologies, we offer a comprehensive array of managed services, ensuring reliable, stress-free, end-to-end IT for your business. Small business? Check out our Total IT package deals! Have you ever considered how much your IT manager could be adding to your business if s/he wasn’t constantly fighting fires? Or if you don’t have in-house IT resources, how much of your workday is spent pretending to be an IT expert, or even worse, adjusting your work around known IT problems that you just don’t have the time to figure out? With Total IT, we take on the maintenance of your IT systems and technical support for your staff, which means that everything works and you can spend your time on growing your business. Technology is an integral part of every modern business. Unfortunately, it isn’t cheap. In addition to potentially huge expenditures on hardware like phones, servers, firewalls, ethernet switches, and routers (just to name a few), there are expensive software and licensing costs for email, anti-spam, anti-virus, and data backup/recovery (again, naming only a few), as well as the cost of IT resources to maintain all of them. With Total IT, massive upfront capital expenses are replaced with low, predictable, monthly charges as you leverage our deep relationships with hardware/software providers, our expertise in the latest cloud technologies, and our volume-based purchasing power. Let’s face facts. No matter how talented your in-house IT team is, they’re limited. In the fast-changing world of technology, they can’t possibly have granular expertise in every facet of IT. With Total IT, our team of experts become an extension of your team. So not only are time-consuming IT tasks being taken off your team’s plate, they’re being handled by technicians and engineers that have vast experience in areas that your team may not, whether it’s email, virtualization, networking, or any of the other areas in which we provide managed services.